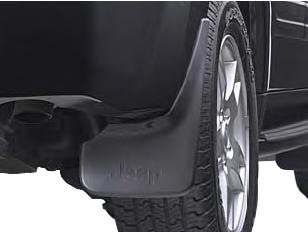 Whether you're splashing down a muddy road or just upping the style quotient in the Cineplex parking lot, these molded splash guards are a popular and useful accessory for your 2005-2010 WK Grand Cherokee. Splash guards protect your Jeep's body and add an attractive accent at the same time. They're made of a rubber and plastic composite that is tough enough to withstand abuse and just flexible enough to bend rather than break. They come in black but can also be painted. Splash guards are sold in sets of two for front and rear installation. The Jeep logo is only on the rear guards. WILL NOT FIT SRT8 MODELS.